Launched: A 400-page book on the purchase of votes in favor of the Constitutional amendment allowing the reelection of FHC, and the media handling of a scandal involving a supposed love affairof FHC. The book arrives in book stores on Saturday, August 31, but even before its publiciation it has preoccupied the nest of Toucans. Luiz Fernando Emediato, publisher of Geração Editorial, which published the book, has been receiving messages. The last message, a few days ago, was direct: A ranking PSDB leader telephone to request that the book not be published, warning that the party had hired a lawyer to prevent the publication, in case the request was not granted. 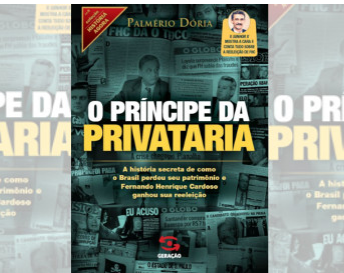 At the center of all the commotion is the launch of The Prince of Privateering –- The secret story of how Brazil lost its wealth and Fernando Henrique Cardoso gained reeelection, by journalist Palmério Dória. The title plays on FHC’s nickname, “Prince of the Sociologists,” sugested by friends of the ex-president, and the term privataria, a reference to the process of privatization commanded by the PSDB in the 1990s and made famous by another release by Geração Editorial, , by Amaury Ribeiro Jr. Along with the asylum granted a dissident Bolivian senator wanted on corruption charges — the Foreign Relations minister was fired as a result — the topic preocupying the Brazilian conservatve press at the moment is the arrival of 4,000 doctors from Cuba to work in areas chronically lacking basic medical treatment. The Miami Herald emphasize a legal challenge to the permissibility of the Cuban 4,000. The treatment of the program in the local press has often verged on hysterical rumor-mongering, such as the front-page headline shown above. Federal prosecutor demands closure of security firm accused of acting as a “private militia” against indigenous peoples. At least 8 attacks and two deaths tied to Gaspem. Witnesses say the company received R$ 30,000 for each violent evacuation. São Paulo – The federal prosecutor (MPF) in Mato Grosso do Sul has filed suit to dissolve Gaspem Segurança and cancel its registration. In the suit, the MPF calls the company a “private militia” and calls for an injunction leading to the temporary suspension of its activities as well as the setting aside of R$ 480,000 for collective damages. The company is known for its modus operandi in the case of properties subject to title disputes and is accused of conducting attacks on indigenous villages, resulting in dozens of injurites and the death of two indigenous leaders. Witness statements say that the company received R$ 30,000 for each violent evacuation and that GASPEM guards were hired to intimidate and terrorize indigenous communities. “This is an organized group that disseminates violence against the Guarani-Kaiowá people of the Southern Cone of Mato Grosso do Sul state, hiring brutal personnel called “vigilantes,” most of them without any qualifications for the job but all of them carrying heavy weapons and ammunition with which they commit offenses against the rule of law and public security,” according to the action filed by the MPF. Last Saturday (August 24), the Aty Guasu tribal council informed the MPF of a threat made by employees of the security firm against the Apyka’i people of Curral do Arame — whose huts were destroyed in a fire last week … According to the complaint, a group of vigilantes prevented the Indians from taking water from a nearby source and theatened to kill them if they returned. In 2009, the same community had its huts destroyed by an arson fire. GASPEM’s role in the episode is still under investigation, as is the company’s involvement in attacks on the Lagoa Rica, Laranjeira Ñanderu, Ñaderu Morangatu, Sombrerito, Pyelito Kuê and Guaiviry communities–- all of them located near areas claimed as traditional tribal lands. GASPEM employees are also accused of the deaths of Dorvalino Rocha and Nízio Gomes. The two cases are underway in the Federal Court of Ponta Porã. Cases of violence involving GASPEM go back to 2005 in Mato Grosso do Sul. The company is registered in Dourados, Mato Grosso do Sul since 1997 and has posted YouTube-hosted publicity material on a short-lived blog in 2011. Note the subliminal flashes of the death-dealing skull, often used as a symbol of the E.M. — the death squad. A year or so ago, a program was devised in which the Federal Police would take charge of training and certifying security personnel. Or so I remember reading. In an October 2011 column, Paula Miraglia calls for more regulation of the private security sector. Last week, two episodes revealed the serious problems associated with private security services in Brazil. In one case, a security company in São Paulo had its arsenal stolen. The estimated number of weapons now in the possession of criminals is 120. In the second case, a bank guard in São Bernardo do Campo fired four shorts during an argument inside the bank agency. Private security and vigilantism are not exactly new, and can be found in different forms throughout our history. Currently, Brazil is among the countries that spends the most of private security. It is an extremely lucrative market and indications are that it will continue to grow. This state of affairs is a response to a scenario that combines the very real growth in criminality with the resulting sense of insecurity. The State is perceived as incapable of provided security. Part of the problem resides in the fact that quality of government oversight has not kept up with the growth of this type of business, which means that these private companies are not strictly regulated. What is more, private security services are not submitted to the same mechanisms of control imposed on state police. When the oversight of police is a delicate matter and fraught with difficulties, this undesirable scenario tends to perpetuate itself. As a result, there are no guarantees, for example, that private security personnel are adequately trained or that the firearms used are legal and in compliance with Brazilian law. But this is not a challenge unique to Brazil. This week, the United Nations held a conference in Vienna to debate the private security sector. The objective of the conference is to unite national governments and specialists in the area to produce a UN document that will serve as a framework for international regulations and as an example for national legislation. In the case of Brazil, improving the regulation of this sector seems like a fundamental step to take. In a historic decision reached on Wednesday, antitrust agency CADE prohibited certain practices of Infoglobo Comunicações e Participações S/A in the advertising market. This is the first time the agency has acted to rein in monopolistic practices by a media company. Infoglobo maintained a policy of discounts for O Globo, Extra, and Expresso da Informação — all three of them Globo subsidiaries — in which it calculated and adapted ad discounts according to the available resources of the advertiser, including commercials aired on TV Globo. In return, it imposed exclusivity as a condition. In this way, Infoglobo prevented competitors from competing on an equal footing in Rio , where Globo controls 75% of the ad market. The case began in 2005 with complaints filed by the Jornal do Brasil and O Dia. It was not until 2012 that the case was judged by the SDE — Secretariat of Economic Justice — an agency of the Justice Ministry. SDE concluded that the practice was an infraction against the economic order, recommending the condemnation of the company. 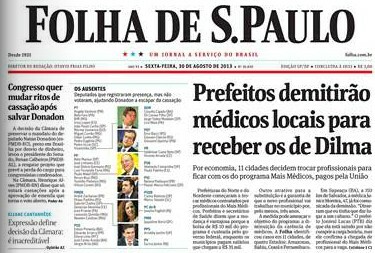 Between the filing of the case and its conclusion, the Jornal do Brasil dropped out of the market. President of the German multinational Siemens, Paulo Stark, has been invited by the federal prosecutor to give a lecture on its system of compliance. Siemens will give prosecutors a lesson in business ethics and compliance — a system of practices which seek to adapt corporate practices to the laws and regulations of foreign hosts. The audience is a group of federal prosecutors and civil servants of the Ministério Público Federal (MPF), the federal prosecutor’s office. At the invitiation of two divisions of the MPF, the president and CEO of Siemens Ltda. Paulo Ricardo Stark, will deliver a lecture on the fifth floor of the Procuradoria-Geral da República (PGR), in Brasília on September 6.